Earlier this week, a Rules aficionado from Bangladesh raised an interesting point relating to taking relief from an immovable obstruction in a water hazard. His query was all the more interesting because he provided a photograph of the circumstances. Here is the question. If a player’s ball lies through the green (e.g. on the fringe of the putting green) may they take relief from an immovable obstruction that is located within the margin of a water hazard? Before you answer, take a look at the photo. I apologise that you cannot clearly read the captions but I will explain the situation below. The ball lies on the fringe about 3’ from the putting green, which is to the right side of the photo. The margin of the water hazard is defined by the log heads, which support the bank above the water level. The log heads interfere with the swing and/or the normal stance of a player making a stroke to the green. So, do the Rules of Golf permit the player to take relief, without penalty, in this situation? Yes, they do. 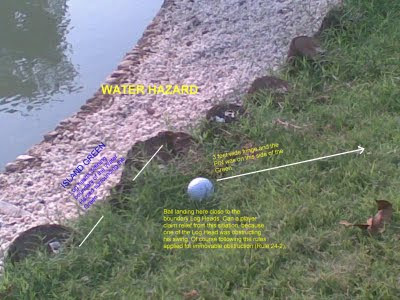 Rule 24-2b states that a player may take relief from interference by an immovable obstruction, except when the ball is in a water hazard or lateral water hazard. Another example of when relief is available under Rule 24-2b is when there is a bridge/path inside the margin of a water hazard that interferes with a player’s stance, or area of intended swing, when their ball lies outside of the margin. Now, let me add a word of caution. In the circumstances described in the question above it is highly likely that the Committee could have made a Local Rule declaring that the log heads were integral parts of the course. In this case there would be no relief and the ball would have to be played as it lies. This illustrates one of my most important nuggets on the Rules; you should never commence a round of golf on a new course without reading the Local Rules first. This can save you several strokes over the course of a year. I wish happy golfing to everyone in this holiday month. Don’t forget, if you haven’t sorted out all your Christmas presents yet, click here for my recommendation. Barry - no connection to this topic, but with the European Tour season starting in 2009 and the new groove rule starting in 2010, are the European Tour guys allowed to play with the modern grooves until January 1st ? This Rule on club face grooves will not be introduced on any of the major Pro tours before 1st January 2010 and the vast majority of players will not be affected until 1st January 2014 at the earliest. Thanks Barry. Over here, the date for the pros to change grooves was pretty easy for the new season, but we didn't think about the Euro Tour starting 2 months earlier. I don't think that you read the two links that I gave you. Because the rule on club face grooves is a Rule of Competition, not a Rule of Golf, it applies at different time for different competitions, depending on when the organiser adopt them. It certainly does not apply to all US Pros from 1st January 2010 as most Pros are not fortunate enough to play on the main tours. For example, the news item on the USGA web site says "The USGA will adopt the condition of competition for U.S. Open local qualifying beginning in 2011". Don't want to be an impolite guest, but I did say the US PGA Tour. The Nationwide and Champions Tours will also be using the new groove rule starting in 2010. The USGA said they will be putting the new rule in place for the final round of US Open qualifying this year, then all of qualifying in 2011. You said, "The USGA said they will be putting the new rule in place for the final round of US Open qualifying this year". That is my point. All the other US Open Championship qualifiers for golf professionals between Jan 2010 and June 2010 will not introduce the Rule of Competition regarding club face grooves. The major tournaments will probably introduce this Rule of Competition from 1st January, but most golf Pros do not play in these tournaments, so they should check carefully whether it is in operation, or not.